I Have a Dream Foundation (IHAD), Boulder, Colo.: iHAD of Boulder provides support and resources to high school students by helping them graduate and achieve their dreams of attending college. Most students in the program have the opportunity to receive a four-year scholarship to support them economically while they pursue college or vocational school. 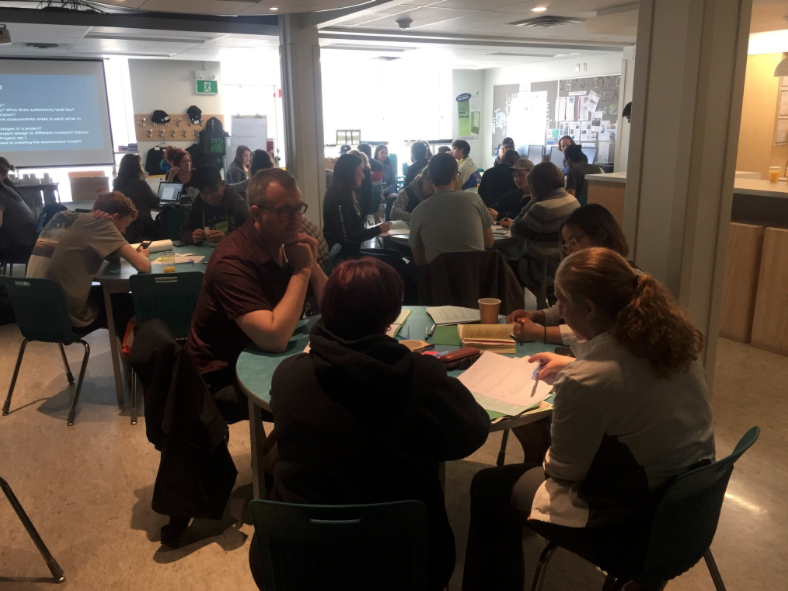 Associate Director of Professional Development Dan Condon and Sebastian Franco led a consultancy and tuning protocol related to parent engagement as part of their team’s monthly Program Director capacity trainings. Jefferson County Educational Service Center Alternative School, Steubenville, Ohio: The JCESC provides services and leadership to various school districts and counties in Eastern Ohio, with the mission of improving the quality of education provided to the students. Anastacia Galloway Reed led a workshop with the staff, continuing its work in becoming a trauma-informed institution. International Leadership Entrepreneurial Development Arts Design (iLEAD), Calif.: iLEAD is an organization of charter schools that focus on student-led assessments and project-based learning as a means to improve the quality of education. Dan Condon continued work on proficiency-based graduation at Empower Generations (a school that specializes in helping pregnant and parenting teens achieve their high school diploma) and Innovations Studio (a high school that places the student in the driver’s seat of her or his own education). Northwest Big Picture Learning Principals, Estes Park, Colo: BPL was founded in 1995 and places students at the center of their own education. 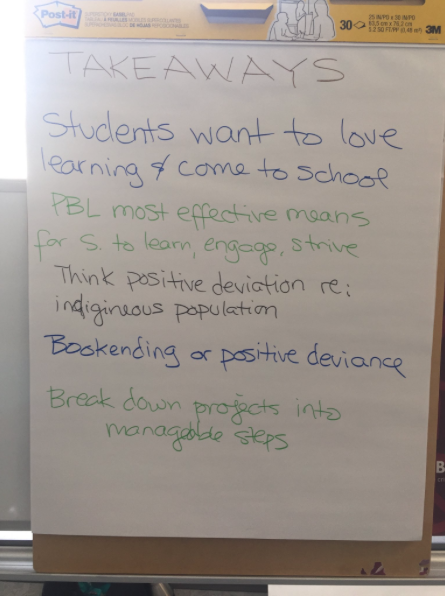 This coming Sunday, Eagle Rock will play host to BPL principals as they work to improve practices in collaboration with Jeff Petty, BPL Regional Director and director of the Puget Sound Consortium for School Innovation. Honda Visionary Dealers, Estes Park, Colo.: Eagle Rock School and Professional Development Center in Estes Park is a nonprofit initiative of the American Honda Education Corp. Eagle Rock Head of School Jeff Liddle, along with Dan Condon and Sebastian Franco, will host a group of Honda’s Visionary Dealers from across the country as they learn more about the Honda philanthropy that created Eagle Rock. American School of Bombay (ASB), Estes Park, Colo.: ASB is an international co-educational independent day school in Mumbai, India, focused on preparing K-12 students for college. A group of ASB teachers and directors visiting from India will be on campus to learn about Eagle Rock’s values, curriculum, and the daily life of an Eagle Rock student. In particular, they are interested in learning about our Presentations of Learning (POLs). Anastacia Galloway Reed and Sebastian Franco will be leading the group throughout the two-day visit. Puget Sound Consortium for School Innovation (PSCSI), Seattle, Wash.: PSCSI focuses on specialized learning for students as they utilize Big Picture Learning practices and look for ways to better prepare youth for the “real” world. Here, Dan Condon continues Eagle Rock’s work with School Foundry, a Principal Leadership incubator. Southern Initiative Algebra Project (SIAP), New Orleans, La. : SIAP has been supporting and working to implement new forms of teaching algebra since 1994, with the goal of having every student understand the topic by 8th grade. Director of Professional Development Michael Soguero is going to be in New Orleans to support the organization with innovative math pedagogy as it finds new ways to improve math literacy across the nation. New Tech Network (NTN), Napa, Calif.: NTN includes a network of 115 high schools, with network services that include extensive planning, design, and implementation support that guide schools towards lasting change and ongoing improvement. Dan Condon makes an initial visit to NTN’s local context to explore partnership following a visit to our Professional Development Center in Estes Park, Colo., last year. Honda Leadership Program, Estes Park, Colo.: The Honda Leadership Program returns to Eagle Rock this June as it embeds itself in our on-campus community to learn more about the Eagle Rock values from Head of School Jeff Liddle and Eagle Rock Student Ambassadors. New Tech Center for Excellence, Napa, Calif.: The Center for Excellence at New Tech High provides cutting-edge professional development, training, and support for educators, schools, and districts looking to transform their practices. Dan Condon continues working with Director Aaron Eisberg as he facilitates a Hedgehog activity to strengthen the theory of action of the Center. Colorado Department of Education (CDE), Estes Park, Colo.: The CDE is the highest branch of education within the state of Colorado and is committed to improving the quality of education each Colorado student receives. Sarah Bertucci and Michael Soguero are hosting visitors from the department as part of Eagle Rock’s licensure reauthorization needed for licensure candidates to receive their teaching license each year. Flagstaff Unified School District, Alpine Institute, Flagstaff, Ariz.: The Alpine Institute is a program within the Flagstaff Unified School District and a magnet program intended to provide an academically focused, place-based service learning educational opportunity for all of its students. 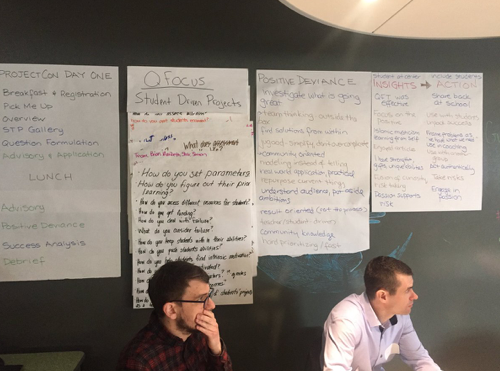 Anastacia Galloway Reed and Sebastian Franco continue working with the team spearheading the Alpine Institute to create a logic model and evaluation questions for students and community members. Rochester City School District Restorative (RCSD), Estes Park, Colo.: The RCSD has an initiative known as the ROC Restorative, which supports schools in efforts to engage in the restorative practices of community building and healthy conflict resolution. Our Professional Development Center in Estes Park will host RCSD’s early-June retreat, with Sarah Bertucci facilitating the group’s inventory success process, as well as its vision for the next steps for their district-wide work . RCSD personnel will also have the opportunity to participate in Eagle Rock School rituals such as our Gathering, and have an opportunity to interact with students and staff. Investing in Innovation Fund (I3)/EIR Project, Washington, D.C.: Part of the U.S. Department of Education, the I3 provides funding to public and nonprofit education agencies through grants that are granted based on criteria demonstrating willingness and alternative methods to improve education. Michael Soguero will be participating in meetings aimed at creating partnerships with other organizations engaged in innovating education. Marin Catholic High School (MCHS), Estes Park, Colo.: MCHS, based out of Kentfield, Calif., is a Catholic co-ed college prep school grounded on faith, knowledge, and service. Sebastian Franco and Dan Condon are leading a group of 20 teachers as they work to innovate their curriculum through an Improvement Science framework. Leadership School Network (LSN), Albuquerque, N.M.: LSN is an industry focused network of schools that engage students through project-based learning to ensure each student graduates with the skillset needed to be successful in current and future workforces. Michael Soguero, Anastacia Galloway Reed and 2017/2018 Public Allies Teaching Fellow in Residence Life Tre’Vonte Marshall are facilitating an LSN retreat aimed at continued development of teacher skills and improvement of the quality of education provided to students. School Reform Initiative (SRI) Pre-Service Cohort, Estes Park, Colo.: SRI is a nonprofit organization serving educators around the country and beyond the United States. It is committed to transforming the way education is taught by focusing on equity and excellence. A cohort from the SRI Pre-Service Group will be staying on campus, where Anastacia Galloway Reed, Dan Condon, Michael Soguero, and Sebastian Franco will be supporting and working with the group. Their work will continue at the SRI national conference that will be held in November 2019 in San Antonio, Texas. Abramson Sci Academy (ASA), Estes Park, Colo.: ASA is one of the top-performing open-enrollment schools in New Orleans, LA, with more than 98 percent of its seniors gaining acceptance to an institution of higher-education. Sebastian Franco and Dan Condon are hosting a visitor from the organization who will observe classes and have the opportunity to speak to our students. Northwest Regional Educational Services District (NWRESD), Estes Park, Colo.: NWRESD values are rooted in student success through equity, partnership, and innovative services with the community in the state of Washington. Sarah Bertucci is hosting a team from NWRESD who will be wrapping up their first year of offering professional development on Deeper Learning and Culturally-Sustaining Pedagogy. The team will also focus on planning for their second year of implementation. Fannie Lou Hammer Freedom High School, Bronx, N.Y.: FLHFHS focuses on the development of students’ minds through academic research and college and career readiness. The school wants to ensure the best possible future for its youth as teachers work with high-risk youth. Michael Soguero will be supporting the school with the alignment of the Algebra Project that he worked on last trimester in St. Louis, Mo. Michael Soguero is the Eagle Rock facilitator for a meeting of stakeholders for several immigrant and refugee organizations. The group seeks better language access in their schools, communities and organizations. It also seeks internships and job readiness classes that lead young people to municipal and private sector jobs. Green School, Estes Park, Colo.: The Green School in Bali, India, teaches sustainability through community-integrated, entrepreneurial learning in a natural outdoor environment. Dan Condon and Sebastian Franco are supporting Glenn Chickering, who represents the school and will be observing Eagle Rock School classes and speaking to students and staff — all the while gathering information he can take back to his institution. Association of Experiential Education, Estes Park, Colo.: Dan Condon and Sebastian Franco are hosting 16 members of the AEE Accreditation Council as they complete work during their stay at Eagle Rock as part of their annual retreat. The Hope Center, Estes Park, Colo.: The Hope Center, a Texas-based organization, is committed to empowering young people to become all they were created to be. Hope Center staffer Cheryl Bushman will on campus at Eagle Rock gathering information to bring to back to her program in Hurst, Tex. Maize High Unified School District 26 6, Estes Park, Colo.: Maize is a unified school district in Kansas that looks to ensure student success through personal connection among staff members and students, character development, and interdisciplinary classes. Dan Condon and Sebastian Franco are hosting three Maize staffers as they seek to take away ideas from the style of teaching and culture that defines Eagle Rock School. PDC Team Retreat, Boulder, Colo.: Each year, the Professional Development Center team at Eagle Rock goes on a two-day retreat to discuss and review the year, check-in on the values and mission of the team, and find ways to improve the quality of work produced nationally and at Eagle Rock School. This year, that retreat will take place in Boulder — just outside of Estes Park — and we are bringing Mac Antigua — Senior Director of Alumni with Public Allies Inc.— as guest facilitator. Crosstown High School, Memphis, Tenn.: Crosstown High School (CXH) will be one of the newest public charter schools opening this August. Eagle Rock School World Languages Specialist Josan Perales and 2017/2-18 Public Allies Fellow in Music Josue Quintana continue their support to get CXH ready and running by August of this year. The New Teacher Project (TNTP), Milwaukee, Wis.: TNTP works with six statewide or state departments of education and in more than 30 other districts or CMOs. It strives to end the injustice of educational inequality by providing excellent teachers to the students that need them most and by advancing policies and practices that ensure effective teaching in every classroom. Dan Condon continues work with TNTP’s executive vice president of public affairs to innovate practice based on the results of its national student survey. E’tude, Sheyboygan, Wis.: E’tude is an educational network that applies an experiential approach to empower people to think critically, engage creatively, and establish strong human connection in order to cultivate the next generation of changemakers. The É’tude schools are tuition-free, public charter schools within the Sheboygan Area School District. Dan Condon begins new work with the network related to Restorative Practices. Public Allies, Wis.: Public Allies is a national movement committed to advancing social justice and equity by engaging and activating the leadership capacities of young people through a service-year program around the United States. Dan Condon will meet again with Public Allies to continue building a stronger relationship between our two organizations, with Eagle Rock hosting 13 fellows each year. Education Reimagined, Burlington, Vt.: Education Reimagined is an innovative organization with the mission of “speeding up” the growth and impact of learner-centered education around the country. The organization wants to support and bring in new educators with similar mindsets to its mission and support students across the country who are struggling with traditional systems. Michael Soguero will be participating in various trainings to bring back new information to Eagle Rock. Big Picture Learning (BPL) National, Atlanta, Ga.: In addition to putting students at the center of their own education, BPL also places youngsters in their communities under the tutelage of a mentor where they are evaluated through exhibitions and demonstrations of achievements, motivation, and habits of mind, hand, and heart. Sarah Bertucci is going to participate in this year’s Big Bang national conference to continue support with BPL in schools around the country. Gahr High School, Estes Park, Colo.: Located in Cerritos, Calif., Gahr HS is a STEM Magnet school with the mission of preparing young minds for college and the future workforce. Dan Condon and Sebastian Franco are hosting 10 staff members from the school here at Eagle Rock in Estes Park as they embed themselves in our campus to work on problems of practices related to their school. National Center for Restorative Justice (NCRJ), Estes Park, Colo.: The NCRJ is an organization focused on supporting those looking for alternative ways to resolve conflict with this generation’s youth. The group will host a weeklong learning session on our campus in Estes Park. If you are interested in the work we do at Eagle Rock, or want to know how your school or organization can connect with the team of talented facilitators in our Professional Development Center, please contact our associate director of professional development, Dan Condon, by emailing DCondon at EagleRockSchool dot org. This entry was posted in Professional Development Center and tagged Abramson Sci Academy, American Honda Education Corp., Anastacia Galloway Reed, Association for Experiential Education, Big Picture Learning, Colorado Department of Education, Crosstown High School, Dan Condon, E’tude, Estes Park School District, Fannie Lou Hammer Freedom High School, Flagstaff Unified School District, Gahr High School, Green School, I Have A Dream Foundation, iLEAD, Jeff Liddle, Jeff Petty, Jefferson County Educational Service Center Alternative School, Marin Catholic High School, Michael Soguero, National Center for Restorative Justice, New Tech Center for Excellence, Public Allies, Puget Sound Consortium for School Innovation, School Reform Initiative, Sebastian Franco, The Hope Center, The New Teacher Project, Toronto High School, Trevonte Marshall.